As a BI-Solution developer, every now and then there comes a time to bring out the serious tools. When dealing with report files, you may find that you need to peek inside the ZIP structure, to trace down an error, or to simply look at some of its metadata quickly. But unzipping manually is tedious. Luckily, on every Linux system (and on Cygwin), the Midnight Commander makes file operations on the console a lot easier. The MC treats ZIP files as a virtual file system, and allows you to browse them like subdirectories and makes it possible to add, edit or remove files from these archives easily. The only problem is: It only works if the Midnight Commander recognizes the file as a ZIP file. And sadly, for PRPTs it does not. Internally the Midnight Commander relies on the ‘file’ command, which relies on the ‘magic’ database to check files against known signatures. So lets teach MC how to play nice with PRPTs. This creates a $HOME/.magic.mgc file, which contains the compiled magic code. and if it says, “Zip archive data, Pentaho Reporting” your system has learned how to treat PRPTs as ZIPs. This entry was posted in Advanced Topic, Tech-Tips on November 4, 2013 by Thomas. The new Pentaho-Metadata data-source scripting-extension I produced recently seems to be well-received. We now have a great opportunity to fully cut back on XActions for plain reporting uses. If everything is placed in one query, the query gets insanely complex and unmaintainable. The query access legacy systems with no sane data models or weird partitioned tables. The data-source needs to be configured based on some other parameter before it is used. Pentaho Reporting now ships with sane scripting support for JDBC, Pentaho Metadata, all Mondrian and all OLAP4J data-sources. The data-source scripting system of the old days is now a dark memory of the past. 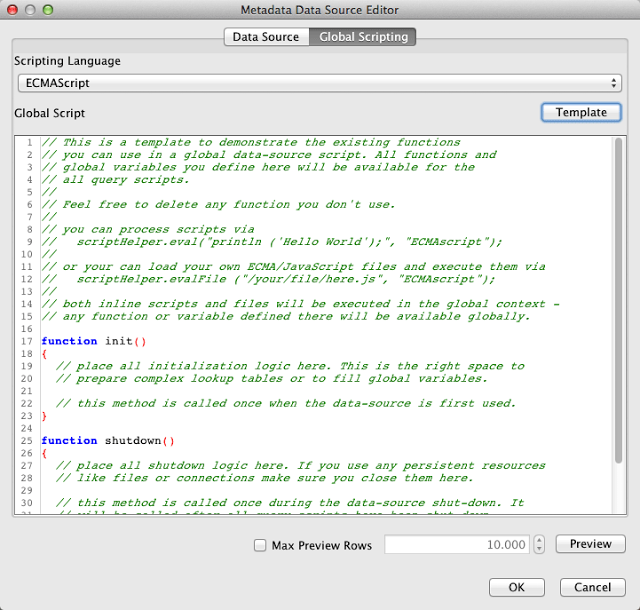 The new scripting is integrated into the data-source itself, so scripts become more reusable. Editing large scripts on the report’s “query::name” attribute was never really fun anyway. You cannot get away with not configuring the data-sources at all, as the report designer and all other tools love to have something static to work with. But you can always reconfigure them to your liking before the report is run. The scripts are always called before the a query is executed on the data-source, even inside the Pentaho Report Designer or the data-source editors. I don’t believe that we will need similar scripting support for the Kettle, Java-Method-Invocation, Table or the Scriptable data-sources. These data-sources either do their own scripting anyway or would not profit from any scripting abilities. This entry was posted in Advanced Topic, Development on December 7, 2011 by Thomas. When you create reports that are mainly used on the web, you probably want to enrich your reports with some basic interactivity. Charts need links and tooltips on their data, drill downs need to be defined and hopefully the information overload of ordinary reports gets reduced via fancy images, hidden sections that only show up on demand and other techniques. The most basic way of creating a annotation on a report is to provide tooltips. Sadly the HTML creators were weird scientists who were used to long and boring lists of footnotes instead of in-lined annotations. The tool-tip system I am integrating is based on the blog posting written by Michael Leigeber, a web designer and .NET developer who runs the Leigeber Web Development Blog. If you want to know how the tooltip script works, please refer to Michael Leigeber’s blog posting. On each element that we define, we can now define the tooltip as HTML text on the “onmouseover” attribute. The tooltip gets hidden when the mouse leaves the element via the “onmouseout” attribute. The first parameter in the “show” method call is used as ‘innerHTML’ on the generated tooltip element. So you instead of just plain text, you can include any HTML content you like, including images, tables or animations. We all agree that static tooltips are rather boring. A tooltip, well-placed can mean all the difference between a information-overloaded report and a report that shows the exactly the right information you need at exactly the right time. Show the main sales numbers, and move the detail content into the tooltip. In Pentaho Reporting, most attributes and styles can either contain a static value or can be computed at runtime via an expression or formula. When you see a green plus on the last column of either the style or attribute table, then you will be able to add a calculation for that property. ="tooltip.show('" & [myfield] & "');"
This produces a tooltip that prints the product code from the steel-wheels example and the product description divided by a horizontal line. This entry was posted in Advanced Topic on August 12, 2011 by Thomas. Every now and then we get the question on how to create a report on database tables with a dynamic date stamped table name. Sounds weirdly cryptic? Well, instead of having a single table for all orders, these systems may have many small tables for all orders of a specific month. Maybe the database is so weak that it can’t handle more than a few thousand rows in a table. But both MySQL nor PostgreSQL are quite capable for some serious data storage (if used right). And even Oracle can do that – and if you have enough money to buy a Oracle license you have money to buy a server (-farm, Oracle ain’t cheap!) too. Maybe they want to speed up data access to the table. After all, a SELECT * FROM TABLE takes a long time if you don’t use a WHERE clause or a proper index. Maybe they have not heard of normalization. Maybe they love to have separate tables so that they can remove the data of older months. A SQL DELETE command is black magic. Deleting the database file in the filesystem is quicker. So if you are using such a system – drop me a note. I am dying to know what application creates such a data-structure. Lets assume we have a database filled with sales data. For the sake of simplicity, lets assume there are several tables named in the schema of “SALES_yyyymm”. The ‘yyyy’ part of the table name represents the four digit year, the ‘mm’ represents the two-digit month. *) Note: Yes I know that putting strings as article ID is bad. But it safes me from outlining a second table. Creating a static report with a hardcoded table name is easy. Write your query and be done with it. The tricky part is to create a report that selects the right table based on the a given date. That date could be the current system date for reports returning the current month’s turnover or it could be a historic date. If you want to make the report dynamic, you will need a parameter to feed the report’s target date into the reporting system and into the query. The table-name in the database contains a partial date value. To make the report return data for a given date, we must calculate the database table name when the report runs based on whatever date the user entered. Standard SQL datasources do not allow you to parametrize structural elements of a query. This is a security measure to prevent an attack known as “SQL Injection“. If you need to compute structural elements of a query, you will have to use a “JDBC (Custom)” datasource (Data -> Add Data-Source -> Advanced -> JDBC (Custom)). Whenever you use a data-source marked as (Custom), you opt out of the standard parametrization. At that point, it is your responsibility to properly validate all incoming user data and to ensure that no one can enter illegal values. The Custom JDBC datasource only contains connection information. The actual SQL query that is executed is computed at runtime. 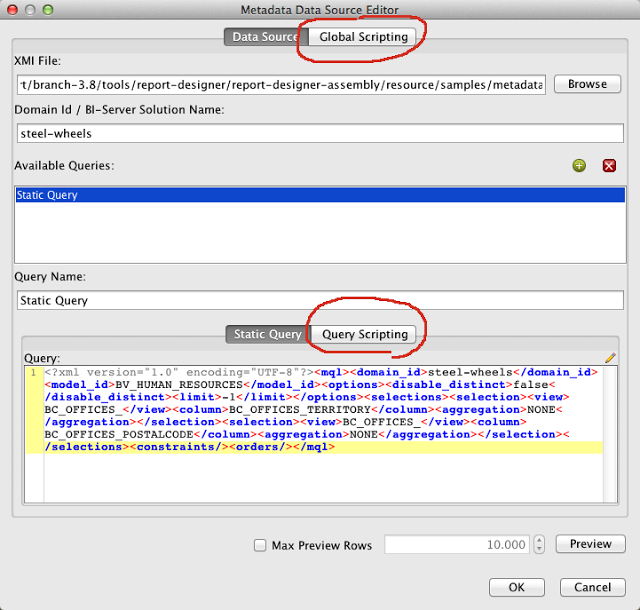 To define a query, put a formula or expression into the “query::name” attribute of your master- or sub-report object. 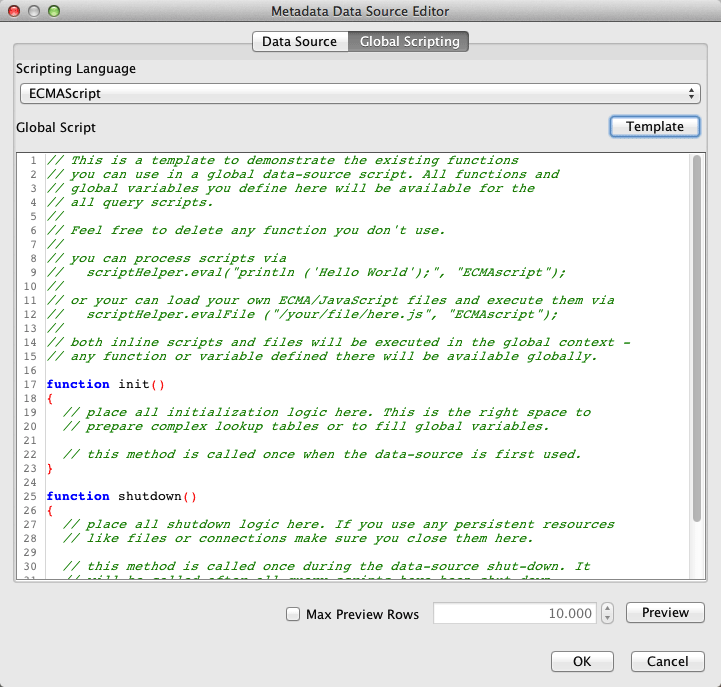 Mike Tarallo create a excellent video tutorial on how to use the Custom JDBC data sources. So instead of repeating everything here, watch the video and learn what the Custom JDBC datasource is and how to use it properly. So we need to declare a parameter to select the table the report should use. You want it dead simple (just for testing, of course!)? Use a plain text parameter that allows the user to enter the year and month to use. SELECT SUBSTRING(table_name, 5) AS "SalesDates"
You can use this information to feed a list parameter. At runtime, the report engine will evaluate the formula and construct the proper query string. That query string is then executed by the Custom JDBC Data-Source. Tip: The report designer does not use queries from formulas during the design process. Read this article to learn how to get designtime column information into the Pentaho Report Designer. Single reports for a single month – that is easy stuff. But sooner or later someone will come back to you and ask for sales data spanning the last year. Lets skip the parameter defining details. Create a parameter that returns the year as string and call it “YearText”. To your database, each of the monthly tables is unrelated to any other of the monthly tables. Databases are great on providing referential integrity on the data within the tables. But generally they care little about the names of the tables and particularly do not assume that table names have any higher meaning. In SQL merging data from several tables happens via an UNION operator. Tables that are merged via UNION must have the same structure – the number and types of the columns must match. Each select statement in a UNION is considered separately. Any “ORDER BY” clause is applied only to the particular table. If you want to sort globally, you will have to wrap the UNION result into another SQL query via a SUB-SELECT. All proper databases support Sub-Selects, but again: For details, consult your database manual. Sub-selects are considerably slower than normal selects. Most databases will start to use temporary tables for the selection result and therefore will answer such queries a lot slower than normal queries. If your performance goes down a lot, consider creating a data warehouse. A query spanning a whole year will be long and complex. Creating more complex reports on such a model is a pain. I would recommend to create a single SQL VIEW that contains all your sales table. This normalizes your data model without breaking your existing programsViews are virtual database tables that make it easier to write SQL queries. If your database supports materialized views, it will create a permanent temporary table that can considerably speed up your reports. So you implemented a yearly sales report. The world is bright. Really? Not long. One unhappy morning, your boss will come to your office telling you he wants to see the sales data for the last four month. And last years first half of the year, oh, and a up to date report showing the last 90 days of sales (ex: 15th of January to 13th of April). If you use a consolidated view as outlined above, you are safe. But for the sake of argument, assume your database administrator’s religion does not allow the creation of VIEWs**. Formulas are a great tool for relatively simple problems. But as soon as the problem is more complex or requires dynamic elements, formulas quickly become unmaintainable. Attributes can be computed by any report expression that returns a suitable value for that attribute. For complex logic, I recommend to use one of the Scripting expressions that comes with Pentaho Reporting. **) This happens more often than you would think. This entry was posted in Advanced Topic on July 20, 2011 by Thomas. “How do I integrate the Pentaho Bi-Server and reporting capabilities with my own (PHP/ASP/JSP/Ruby/whatever-) web-application?” Thrilled by the BI-Server’s blazing features, many users want to enrich their applications with rich reporting and analysis capabilities, and unlike the dinosaurs of the BI-Market, our Open-Source solution makes this easy and cost effective. The techniques I am going to describe in this blog-post are no magic and can be applied to other web-application (like our Data-Integration server) as well. First, you need to get a Pentaho system up and running. For now, and for the sake of easiness, lets stick with the standard Pre-Configured Installation (PCI). The Pentaho PCI is a Apache Tomcat server that runs the Pentaho BI-Server as its only web-application. Unpack the ZIP or tar.gz archive into a directory. On Linux or Unix systems, I would recommend something like “/opt” or “/usr/local/” as target. On Windows .. well, in that case you are just experimenting and not planing for production, I assume. So any folder will do. You need that later for publishing reports or other files to the server. This is the major obstacle for most new users when trying to get their own content up and running. Change the parameter “fully-qualified-server-url” to the public URL of your server. Optional: If some other tomcat installation runs on your system, your port 8080 may be in use already. Optional: Install the BI-Server as a system service. You should now be able to direct your web-browser to the BI-Server and should see the login screen when you type http://localhost:8080/ into your browser’s address bar. Integrating a BI-Server into a existing PHP application is easy now. All you need is a running BI-Server instance that is accessible by your users. From now on, I will simply use the Pentaho Demo Server for our little integration project. The Pentaho Demo Server is a slightly tuned down installation of the Pentaho BI-Server. Anything I am going to show will work in the same way with the standard community edition. When refering to the two applications, I will use “application” for the PHP, ASP or Ruby application that wants to utilize the Pentaho Platform. 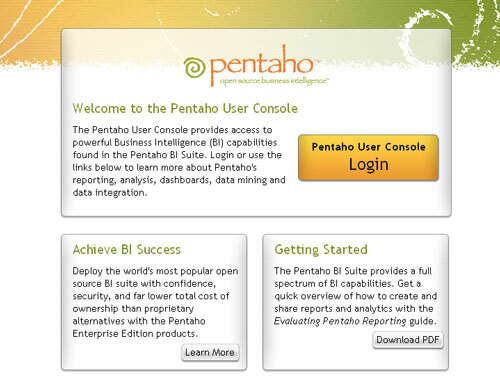 I will use the term “Pentaho” for the Pentaho BI-Server. The most primitive way of connection two web applications together is to make the application include Pentaho in an frame or by opening up the specific report or analysis view in a new window. This file could have been generated by any server side program. Use your phantasy here. Reports can be parametrized by adding the parameters for the report to the URL. The parameters must be properly URL encoded. Use UTF-8 as character encoding. Inside the Pentaho Platform, each report has its own page that can be accessed independently of the Pentaho User Console. The sample above links to a report on the system, using the predefined username and password. Note that the username and password is given in cleartext. To make this more secure you will need to set up a Single-Sign-On solution. Pentaho Enterprise Edition comes with support for setting up Single-Sign-On for CAS rather easily via some setup scripts that take care of the ugly work. If you are using community edition and are willing to spend the time, you can always set it up yourself. Alternatively you can set up Pentaho to work with Active Directory or LDAP instead. Here are some sites with documentation to get you started. And don’t forget: The Pentaho Wiki also contains a load of information. Internally, Pentaho uses Spring Security, so with enough time and patience you should be able to connect Pentaho to anything on this planet for authentication purposes. This entry was posted in Advanced Topic, BI-Server, Parameter, Tech-Tips on June 20, 2011 by Thomas. Today, we will talk about environment variables. Environment variables are system level parameter. You can use them to configure reports based on where you deploy the report. We provide several properties for use within the Pentaho BI-Server. solutionRoot: The file-system location where the local copy of the solution repository can be found. roles: The roles as CSV-encoded list. The CSV string is quoted according to the Excel CSV quoting rules. Inside the BI-Server, environment variables can also be used to interact with the server’s environment to query session and global parameter information. The report environment allows you to access values stored on the current user’s session or as global parameter by using a special prefix. Requesting a environment property “session:name” will query the session context for an entry called “name” and returns the string representation of this object to the report. Likewise, prefixing a environment property with “global:” will query the global parameter collection of the BI-Server. Therefore querying a environment variable “global:name” will look for a entry “name” in the Bi-Server’s global parameters. The Pentaho Reporting Engine offers the formula function “ENV” to access the report environment properties. If the variable is a CSV encoded string, you can use the CSVARRAY function to parse the string into a array of strings. This array is then suitable to use for multi-selection parameters or SQL-IN clauses. You can now use these variables as part of other formulas, for instance to compute URLs pointing to documents on the server server. When you open up the Pentaho Report Designer, you will see several of the well-known environment variables listed as fields on the report itself. Using the ENV function is flexible, but not very convenient. So we added a automatic mapping to the reporting engine. The various env:* fields you see in a report are what I call “well-known” fields. As Pentaho Engineers we know knows that they exist on the server and are heavily used by our users. So we added a mapping to the system so that they automatically become fields without having to use a formula function to read their values. The list of “well-known” fields is defined in the global report configuration. The global configuration can be edited by creating or editing a file called “classic-engine.properties” inside your Pentaho Report Designer and Pentaho BI-Server directories. Inside the Pentaho Report Designer, this file resides in the “resources” directory in your Pentaho Report Designer installation directory. For the BI-Server you can find this file in the “pentaho/WEB-INF/classes” directory. To make your reports work consistently inside the Report Designer and the Server, make sure that both files have matching definitions. In case value contains a comma separated list (using the Excel-CSV quoting rules for strings that need to be quoted), then you can make that list available as array by appending -array to its name. The engine will recognize the “-array” suffix and will look for a “value” property instead, parses that into a string-array and returns you the array. The array then can be used in a SQL-IN clause. The prefix “env::” is a convention inside the reporting engine to separate environment fields from other fields. If you omit this, you have to make sure that none of the fields returned by your data sources and none of your expressions or functions provide a value under the same name. This would overshadow your environment property and renders it inaccessible. This entry was posted in Advanced Topic, BI-Server, Tech-Tips on May 27, 2011 by Thomas. Are your reports running slow? Do you have problems finding the solution to the problem? The performance of reports depends on many factors, and as many of these factors are interdependent, it is not always easy to untangle that mix. But since the release of Pentaho Reporting 3.8, at least there is some help in your quest for performance with some additional log settings that spit out some performance metrics. With this release, we added a bunch of loggers at strategic places to monitor the performance of running reports. This setting enables the profiling mode via the logger “org.pentaho.reporting.engine.classic.core.layout.output.PerformanceProgressLogger”. If this property is set to ‘true’, a new progress-monitor gets added to the report process. This monitor can print periodic status messages while the report is processed. The Monitor itself can be tuned to output only the information that you seem most relevant. You can enable the logger to print a statement on every new page, on every new processing level or you can print periodic updates for every 5000 rows that have been processed by the engine. Pentaho Reporting is a layouting engine that combines tabular data from a data source with calculated data and a layout description to produce the final documents. During the last few years I have not seen a report where the report functions or expressions formed the bottle neck of the report processing, so I happily ignore them unless everything else fails. If you are using SQL or MQL data sources, then your database may be responsible for the slow execution of the report. Depending on the database, the use of scrollable result sets may be lethal to the report performance. With a scrollable result-set the database only supplies a sliding window of the data to the reporting engine. This reduces the reporting engine’s memory footprint, but puts a larger strain on the network and I/O capabilities of the system. If you pull a lot of data and the database is slow on supplying the data via a scrollable result-set then you pay a lot for accessing the data without knowing it. The query itself will return quickly, as it only initializes the cursor leaving the job of transferring the data out of the cost-equation. Be aware that the memory consumption will go up with this setting as we fully buffer the result set in the local memory. On the positive side, access to the local memory is blazing fast and therefore your report will run faster now. I usually test the database first, as this test is simple to make and rules out a large chunk of the potential trouble makers. In the reporting engine, the performance of the report is usually limited by the layouting and text processing that is necessary to produce the report. Performance is mainly dependent on the amount of content printed. The more content you generate, the more time we will need to perform all layout computations. Large Inline-sub-reports are the most notorious reason for bad performance. The layouted output of a inline-sub-report is always stored in memory. Layouting pauses until the sub-report is fully generated and then inserted into the layout model and subsequently printed. The memory consumption for this layouting model is high, as the full layout model is kept in memory until the report is finished. If the amount of content of the sub-report is huge, you will run into out-of-memory exceptions in no time. A inline-sub-report that consumes the full width of the root-level band should be converted into a banded sub-report. Banded sub-reports are layouted in a streaming fashion and output is generated while the sub-report is processed. The memory footprint for that operation is small as only the active band or the active page has to be held in memory. Some image generating scripts on the web can cause troubles with the reporting engine. For content loaded via HTTP connections, we rely on the cache control headers sent by the server. For this we check the “last-modified” header of the HTTP-response. If there is none, then we consider this file non-cacheable. We check cache header against the original object by issuing a HEAD request to the URL. This may cause problems in case the image service provider does not properly implement a HEAD handler. In Pentaho Reporting 3.8, we work around most of these troubles by assuming the worst from the web-authors. A non-cachable file is still cached for at least 10 seconds (the default configuration) as most programmers of web-services do not care, do not know or are not able to send a “last-modified” header or implement a HEAD response handler. For long running reports, this value must be increased to a larger number that matches at least the expected runtime length of the report. You can also disable cache control completely, which will cause the reporting engine to never reload the content as long as the main resource cache still holds a reference to it. # end of life in the underlying resource cache has been reached. As a general rule of thumb: Caching must be configured properly via a valid EHCache file. If caching is disabled or misconfigured, then we will run into performance trouble when loading reports and resources. A misconfigured cache can considerably slow down reports if you use a resource-message, resource-label or resource-field element in the report. The resource elements load their translations via LibLoader, which in return depends on properly working caches to avoid repeated and expensive I/O operations. You can configure EHCache via an “eh-cache.xml” file placed into the root of the classpath. A pageable report generates a stream of pages. Each page has the same height, even if the page is not fully filled with content. When a page is filled, the layouted page will be passed over to the output target to render it in either a Graphics2D context or a streaming output (PDF, Plaintext, Pageable-HTML etc). band does not fit on the page. To avoid unnecessary rollbacks prefer “break-after” pagebreak markers over “break-before” markers. In most cases, the pageable outputs will be fairly simple and non-problematic, as they only hold a minimal amount of data in memory. A table export produces a table output from a fully layouted display model. A table export cannot handle overlapping elements and therefore has to remove such elements. In versions prior to Pentaho Reporting 3.8, we also added some debug information to the layout nodes. This did increases the memory consumption but made developing reporting solutions easier. Although these debug settings should never be enabled in production environments, many users of the community edition may still run with these settings enabled. In Pentaho Reporting 3.8 we changed the built-in default so that no debug-information gets added. Those who could interpret the output probably know how to enable the setting, and everyone else just suffered the bad performance. In HTML exports, there are a few settings that can affect export performance. This setting controls whether images linked from HTTP(S) or FTP sources are linked from their original source or copied (and possibly recoded) into the output directory. The default is “true” as this ensures that reports always have the same image. Set it to false if the image is dynamically generated and should always show the most recent view. Disabling this setting also avoid some I/O for copying and recoding the images during the report generation, although for most images used in the report this performance gain wont be noticeable at all. The style settings and the buffered writing settings control how stylesheets are produced and whether the generated HTML output will be held in a buffer until the report processing is finished. Style information can either be inlined, stored in a external *.css file or can be contained in the HEAD element of the generated HTML file (when Inlinestyles is set to false and ExternalStyle is also set to false). will not be rendered correctly. It is safe to disable buffering if the styles are inlined, as the browser will not need to fetch a external stylesheet in that case. Inlined styles greatly increase the size of the generated HTML and may slow down the rendering of the generated HTML file tremendously if the file is large. Buffered content will appear slower to the user than non-buffered content, as browsers render partial HTML pages while data is still received from the server. Buffering delays that rendering until the report is fully processed on the server. Reports that are only written to disk or downloaded from the server to be archived and then forgotten should have buffering disabled so that they can be streamed directly to the client. Buffering consumes memory and can potentially lead to OutOfMemory conditions on smaller servers if too many users request large reports at the same time. However, in most reasonable configurations, buffering is harmless. So far no browser is able to properly render a HTML file that is larger than 20 MB. So if excessive buffering causes troubles then rest assured that in case buffering works your browser surely wont. This entry was posted in Advanced Topic, Tech-Tips on May 20, 2011 by Thomas.